Ghost Rider and Green Goblin Ride Again! Two Old Marvel Selects Return in New Packaging! May 2013 - The Marvel Select line has put out a lot of great figures in the 11 years it's been around, and not all of them are easy to find nowadays! Luckily, Diamond Select Toys regularly goes back and re-issues some of the more popular figures to make sure everyone who wants to start a Marvel Select collection has the ability to get the characters they want. This year, DST has brought back the Classic Green Goblin figure as well as the original Ghost Rider, Johnny Blaze! 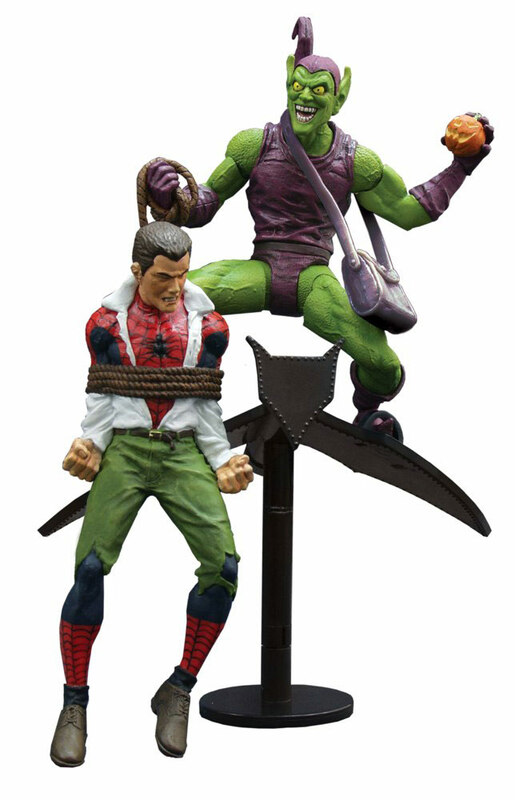 Blaze stands atop a base depicting a particularly unpleasant section of Hell, and Goblin re-creates the famous cover of Amazing Spider-Man #39, with glider and tied-up Peter Parker. Check out the redesigned packaging below, and look for both figures to return to comic shop shelves (and online store databases) this summer!